The Alinco DJ-C1T takes HT compactness to a new level! Only about the size of a credit card, this HT is still feature packed and delivers a 300 mW RF signal on 2 meters. You get: 20 memories, CTCSS tone encode, key lock, TX lamp, reverse monitor, scanning, battery save and digital display. The extended receive function on the DJ-C1T even includes the VHF air band. The transmit range of this HT is 144-147.995 MHz and receive is 118-173.995 MHz. Each DJ-C1T comes standard with: AC wall adapter, built-in rechargeable Lithium-ion battery, built-in telescopic antenna and soft case. This amazing little HT is only 2.2 x 3.7 x 0.42 inches 3 oz. (56x94x11mm 75g). 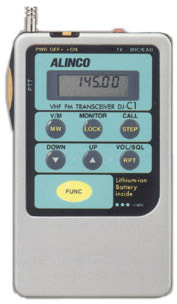 The Alinco DJ-C4T is similar to the DJ-C1T, but operates on 70 cm instead of 2 meters. The tranmsit and receive range is 420-449.9995 MHz. 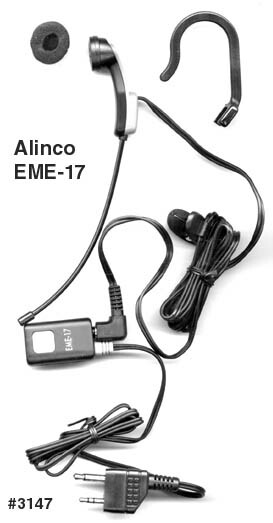 EME-16 Tie pin mic with PTT and earbud. EME-17 Boom mic with PTT and earbud with earhook. Copyright 2006-2018, Universal Radio, Inc.